August 13, 2013 By Tina M 43 Comments This post may contain affiliate links. Read my disclosure policy here. Are these steel cut oats, instant oats? so you don’t need to cook the oats first? and do you mix the wet ingredients all together first before adding in the dry ingredients? We don’t like coconut in our house. What would be a good sub for that? Rice crispies maybe? Is there a good substitute for flax? My son is allergic to flax and sesame and we stay away from chia and poppy. Thanks! Hi Terri! I bet you could just omit the flax altogether. It would be healthier to use unsweetened, but both would work! What is the sugar free recipe? I would love to see that one as well. I must have missed it. 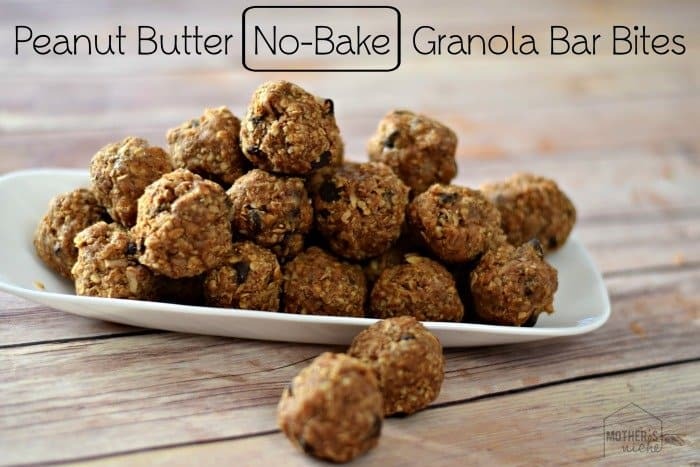 I’ve made some granola that I was planning on making into bars that have oats, ground flax, wheat germ, nuts and dried cherries and cranberries in it and just saw this and would love to try it with what I’ve already made… Do you think it would work with already baked granola, and also I’m not a big fan of peanut butter but I have a new jar of almond butter that I would like to try. Hi Tina, these look delicious! Is there anything I could sub the peanut butter with as my sons school is allergy aware and as such I would like them to be nut free. Thanks! Oh good!! We love them for everything! For those wanting to avoid peanut butter (we are not even allowed any PB substitutions at our school), I just blend mushed bananas and oatmeal and then whatever add-ins I have on hand (raisins, choc chips, Craisins, coconut or nothing). No sweetener of any kind required. Spoon on to a cookie sheet, bake for 10 min at 375. The ones you’ve posted here all sound delicious though and I can’t wait to shake it up a bit here! 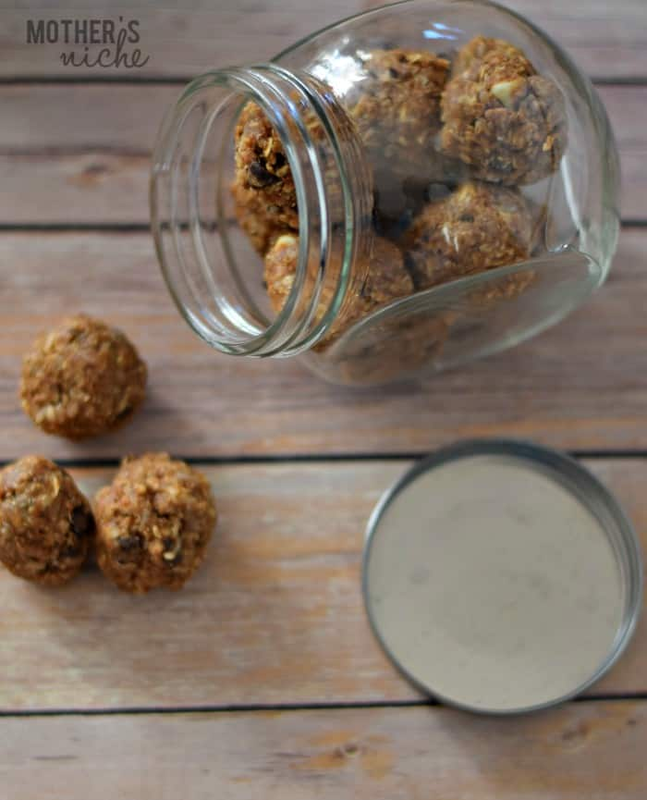 Just made these but didn’t have flax, so I used some almond meal. Look pretty good, taste pretty good…let’s hope the kids eat them! These were delicious! Could you post the link to the sugar-free version as well? Thank you! These were really good! 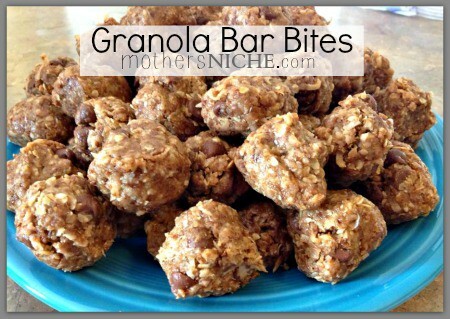 I was skeptical about making this because Ive tried so many types of these no bake granola bars and they never turn out. I just made these after dinner with a 1 yr old and 3 yr old and it was the quickest most funnest after dinner activity we have done in awhile. I had a problem getting everything to mix and stick together but I added like a 1/2 cup of unsweetened coconut milk and then it mixed up just fine. I think my honey that I used was just too thick. I was surprised that I actually had all of these ingredients on hand EVEN THE GROUND FLAX LOL. Put half in freezer and half in fridge. I used raisins instead of chocolate chips because I just thought those would be less messy for the kids. Thank you so much for sharing this and hoping my experience gives you a smile! Thank you Erin! I’m so glad you enjoyed them. They are a favorite at our house! I would also like the nutritional information and serving size. This may sound silly, but is it coconut cereal flakes or white coconut flakes? About how many bites does this make? I just tried to make these but they wont stick together! I gave up and put it all in the oven. It will make a yummy granola to have with my yogurt! I will try again! These sound amazing. I have a 10 month old who would probably love to have some. Could I just omit the honey or should I sub it with maplesyrup? These look amazing! I have a 10 month old who would love them. Can I just omit the honey or should I sub with something like maple syrup? Just made these and used agave instead of honey. I couldn’t get it to stick together either but found if I wet my hands every few balls I was able to roll them far easier. Thanks for the recipie! Hi just tried this recipe and stored them in fridge for about 4 hours. Are they supposed to still be moist on the outside? Mine are real sticky after being in the fridge, too messy for my kid. Wondering if I can fix it some how bc at this point I’m about to toss them. I use the mini chocolate chip morsels. 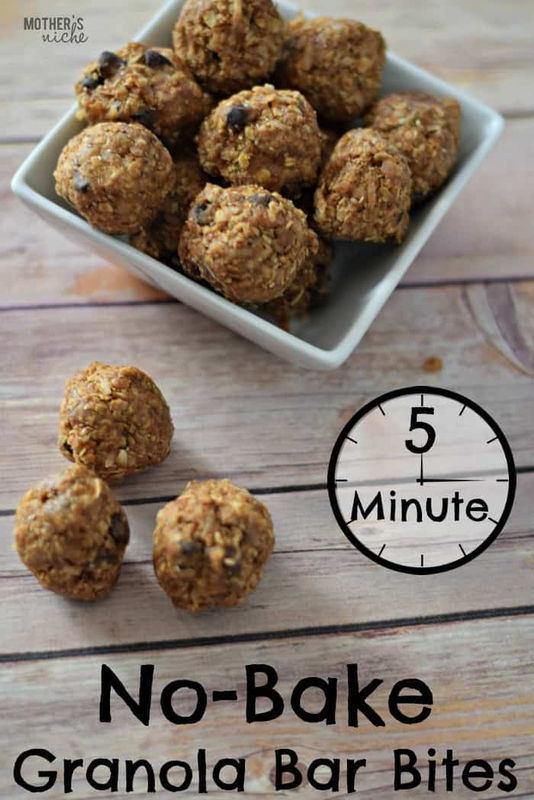 The smaller size helps the balls to stick together better and you can actually use less then the recipe calls for. I bet you could just leave it out! where is the sugar free recipe ?? Any suggestions for what to use instead of peanut butter as my daughters school doesn’t allow nuts?